DID TRUMP’S TAX CUTS DELIVER AS PROMISED? DID TRUMP'S TAX CUTS DELIVER AS PROMISED? 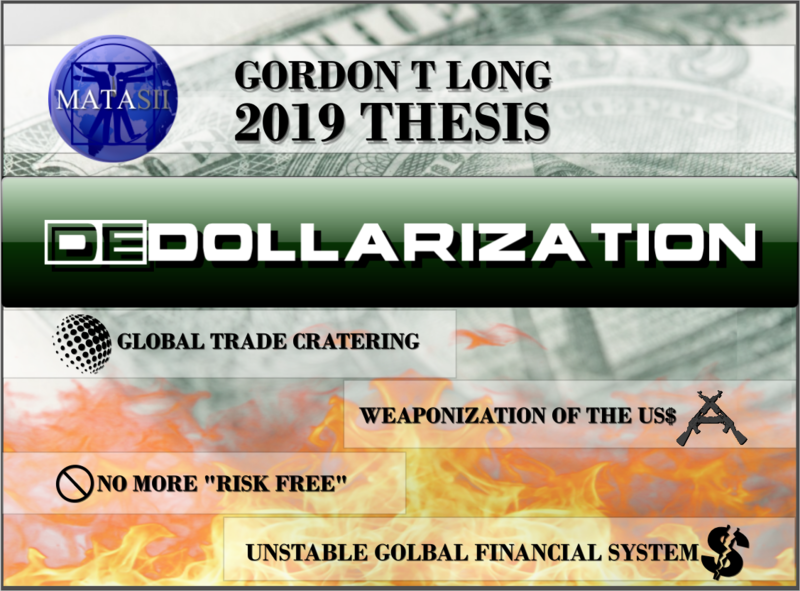 SOURCE: 02-28-19 - Lance Roberts - "Tax Cuts A Year Later – Did They Deliver As Promised?" The problem for the “Trump Tax Cuts” is that they were introduced at a time when the economy was already running near full employment. Reagan’s tax cuts were effective because they were “timely” due to the economic, fiscal, and valuation backdrop which is diametrically opposed to the situation today. Not surprisingly, the change to employment over the last year has been minimal tied primarily to population growth. What drives employment is sustainable economic growth that leads to higher wages, increased aggregate demand and higher rates of production. In other words, employment adjusts over time to respond to the strength and direction of the economy rather than the movements in tax rates. Over the long term, it is the direction and trend of economic growth that drives employment. The reason “direction and trend” is because beginning in 1980, both the direction and trend of economic growth in the United States changed for the worse. Given the economy was already growing near maximum capacity, the boost from tax cuts was mostly mitigated. The tailwinds provided by initial deregulation, consumer leveraging, declining interest rates, and inflation provided huge tailwinds for corporate profitability growth. Rising debt levels are the real impediment to longer-term increases in economic growth. When 75% of your current Federal Budget goes to entitlements and debt service, there is little left over for the expansion of the economic growth. As debt levels, and subsequently deficits, increase, economic growth is burdened by the diversion of revenue from productive investments into debt service. 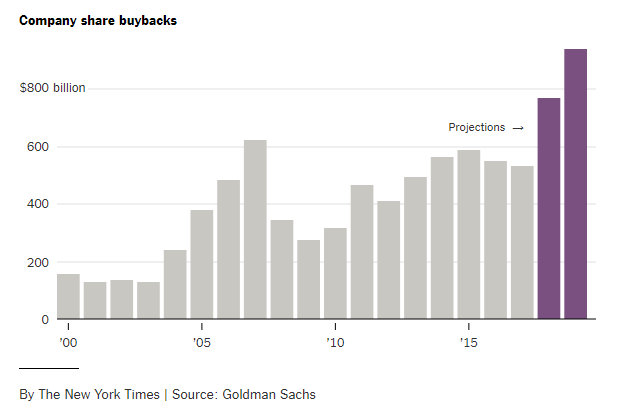 The one place that tax cuts did work, as we expected, was in the expansion of corporate share buybacks. 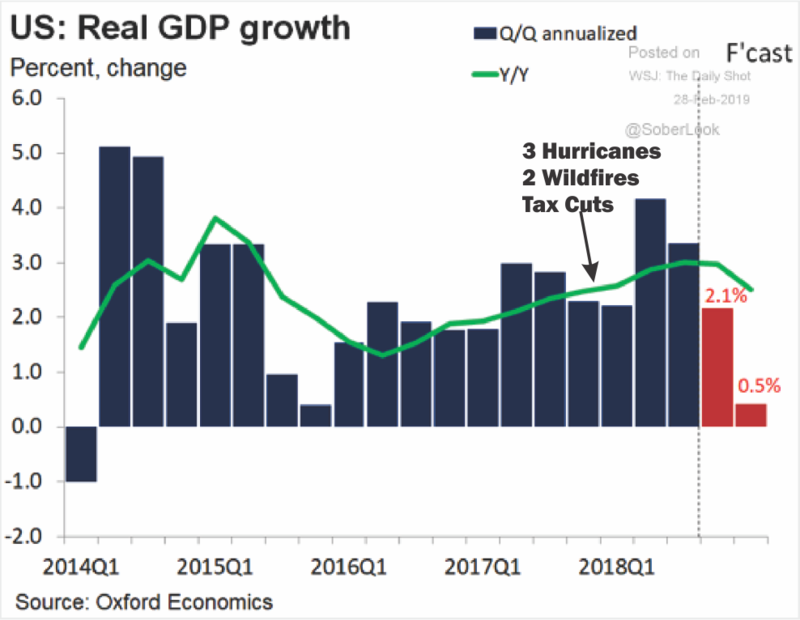 The spurt of economic growth in the first half of 2018 came from the impact of three massive hurricanes and two major wildfires in late 2017 which led to a surge in spending for reconstruction. That input has now faded and economic growth rates are beginning slow. Other than creating a massive windfall to corporate bottom lines, tax cuts not only failed to improve the economic prosperity for the vast majority of Americans, but has now entrenched the economy into a deeper “fiscal hole” than we were when Trump took office. As a “fiscal conservative,” my concern continues to be the entire lack of fiscal responsibility in Washington D.C. There was a time when politicians at least acted like they were concerned about the budget but that process was clearly abandoned a decade ago. While schemes and tricks to get votes may work in the short term, the long-term consequences are already playing out in real-time. Why do you think “socialism” has become a “thing” in what once was considered the greatest capitalist economy on the planet? Tax Cuts A Year Later – Did They Deliver As Promised? Leading up to and following the passage of the Tax Cuts and Jobs Act (Trump Tax Cuts) I wrote a lot of analysis on the fallacy of tax cuts, why tax cuts wouldn’t change corporate behavior, and why tax cuts are an ineffective method of improving economic growth. Speaking to NBC’s Meet the Press, VP Mike Pence argued at the time he was confident that eventually, the deficit would decline as it would be overcome by surging economic “growth” thanks to the tax cuts it will fund. Taxes Are Reduced Which Puts $100 Billion Into The Economy. As shown in the chart below, changes to tax rates have a very limited impact on economic growth over the longer term. Furthermore, it was believed that tax cuts would lead to a boom in employment. The chart below shows the corporate tax rate versus employment back to 1946. Corporate tax levels create employment change at the margin. If you look at the chart you will notice that when corporate tax rates are reduced employment did marginally increase but only for a short period of time. The problem for the “Trump Tax Cuts” is that they were introduced at a time when the economy was already running near full employment. Not surprisingly, the change to employment over the last year has been minimal tied primarily to population growth. What drives employment is sustainable economic growth that leads to higher wages, increased aggregate demand and higher rates of production. In other words, employment adjusts over time to respond to the strength and direction of the economy rather than the movements in tax rates. The chart below shows economic growth versus employment. Do not misunderstand me. Tax rates CAN make a difference in the short run when coming out of a recession as it frees up capital for productive investment at a time when recovering economic growth and pent-up demand require it. However, as I stated previously, given the economy was already growing near maximum capacity, the boost from tax cuts was mostly mitigated. Over the long term, it is the direction and trend of economic growth that drives employment. The reason I say “direction and trend” is because, as you will see by the vertical blue dashed line, beginning in 1980, both the direction and trend of economic growth in the United States changed for the worse. Yes, as I noted previously, Reagan’s tax cuts were effective because they were “timely” due to the economic, fiscal, and valuation backdrop which is diametrically opposed to the situation today. “Importantly, as has been stated, the proposed tax cut by President-elect Trump will be the largest since Ronald Reagan. However, in order to make valid assumptions on the potential impact of the tax cut on the economy, earnings and the markets, we need to review the differences between the Reagan and Trump eras.My colleague, Michael Lebowitz, recently penned the following on this exact issue. 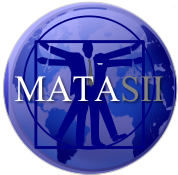 The differences between today’s economic and market environment could not be starker. The tailwinds provided by initial deregulation, consumer leveraging, declining interest rates, and inflation provided huge tailwinds for corporate profitability growth. 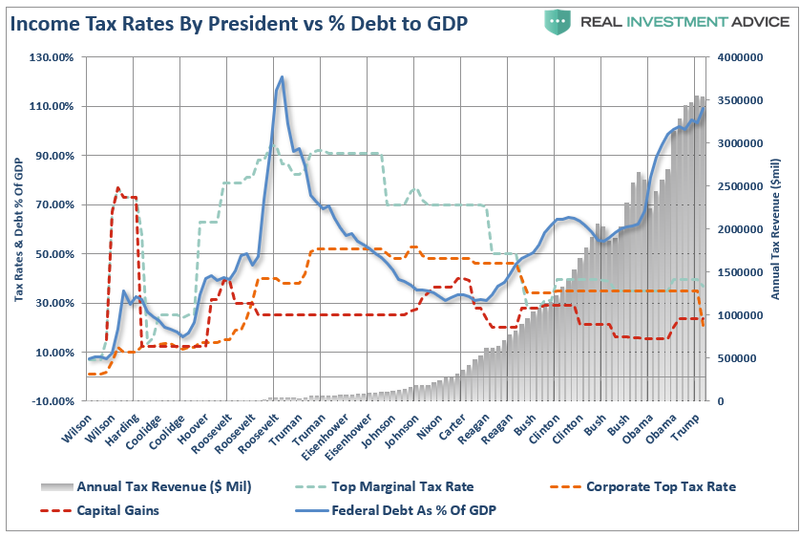 The chart below shows the ramp up in government debt since Reagan versus subsequent economic growth and tax rates. As noted, rising debt levels are the real impediment to longer-term increases in economic growth. When 75% of your current Federal Budget goes to entitlements and debt service, there is little left over for the expansion of the economic growth. The tailwinds enjoyed by Reagan are now headwinds for Trump. The problem with the claims is there is NO evidence that is the case. The increases in deficit spending to supplant weaker economic growth has been apparent with larger deficits leading to further weakness in economic growth. In fact, ever since Reagan first lowered taxes in the ’80’s both GDP growth and the deficit have only headed in one direction – lower. 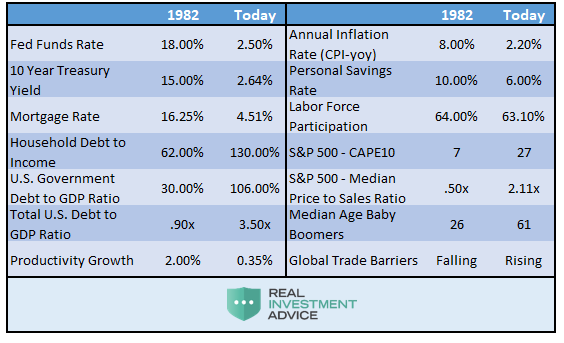 As noted above, there are massive differences between the economic and debt related backdrops between the early 80’s and today. The revenue loss is already occurring as shown in the chart below. The true burden on taxpayers is government spending, because the debt requires future interest payments out of future taxes. As debt levels, and subsequently deficits, increase, economic growth is burdened by the diversion of revenue from productive investments into debt service. Not surprisingly, focusing tax cuts on corporations, rather than individuals, only exacerbated the divide between the top 1% and the rest of the country as the reforms did not focus on the economic challenges facing us. These challenges will continue to weigh on economic growth, wages and standards of living into the foreseeable future. As a result, incremental tax and policy changes will have a more muted effect on the economy as well. As investors, we must understand the difference between a “narrative-driven” advance and one driven by strengthening fundamentals. The first is short-term and leads to bad outcomes. The other isn’t, and doesn’t. “Cheerleaders for the tax cut argued that the heart of the law — cutting and restructuring taxes for corporations — would give the economy a positive bump, giving companies incentives to invest more, hire more workers and pay higher wages. Skeptics said that the money companies saved through tax cuts would merely increase corporate profits, rather than trickling down to workers. While wages did rise marginally over the last, due more to tightness in the labor market rather than tax cuts, corporations failed to share the wealth. 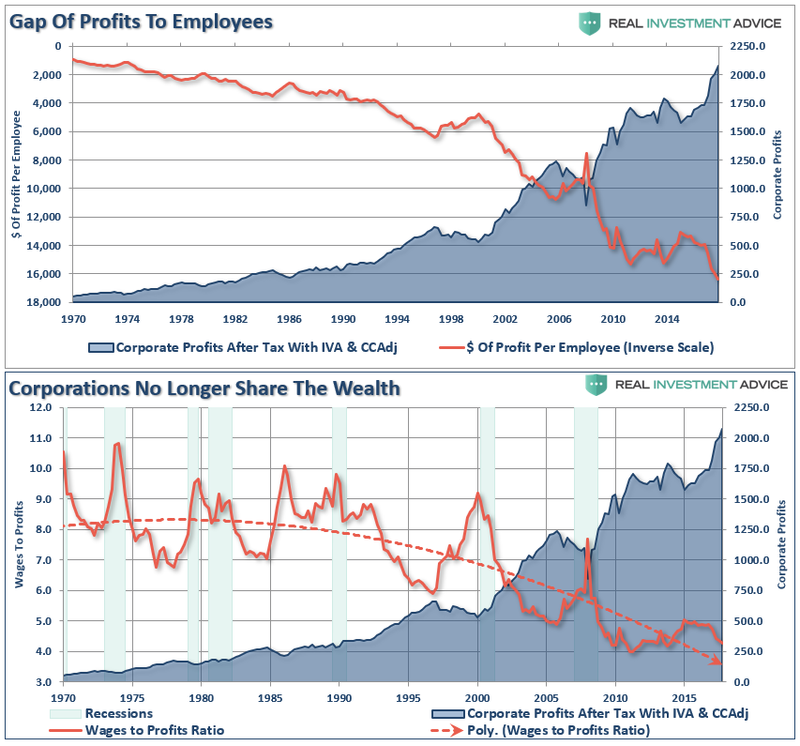 In fact, the ratio of profits to workers wages have materially worsened since the enactment of tax cuts. Despite the commentary to the contrary, the reality is, as we predicted over a year ago, that tax cuts in a late stage economy would have little, if any, real impact. The fiscal health of the United States is deteriorating fast, as revenues have declined sharply. The federal budget deficit — the gap between what the government collects in revenues and what it spends — is approaching nearly $1 trillion. It’s highly unusual for deficits and borrowing needs to grow this much during periods of prosperity. As a “fiscal conservative,” my concern continues to be the entire lack of fiscal responsibility in Washington D.C. There was a time when politicians at least acted like they were concerned about the budget but that process was clearly abandoned a decade ago. While schemes and tricks to get votes may work in the short term, the long-term consequences are already playing out in real-time.